This is probably the most traditional bridesmaid dress look, and for good reason! Its beautiful and the most formal of the options on this list. 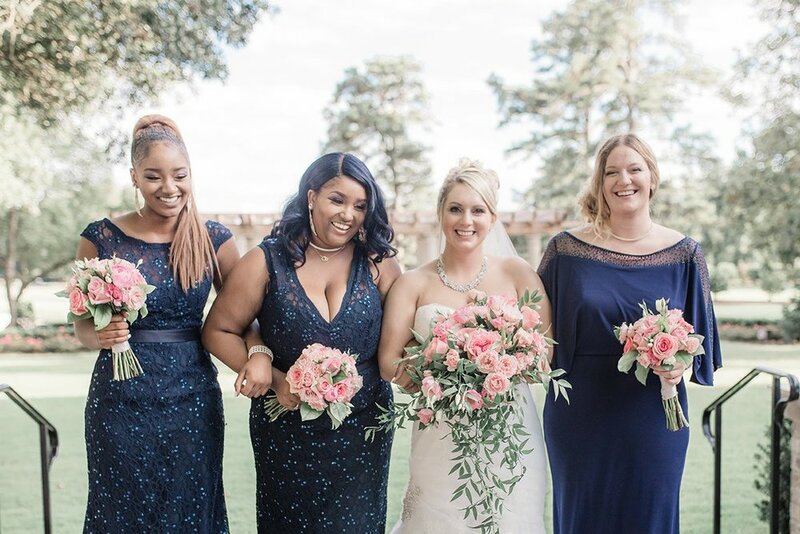 The matching look is gorgeous especially if you have bridesmaids who are all a similar body type, so that the same cut is flattering on everyone. To avoid being overly identical, your girls can customize their look with different accessories and hairstyles. This option is quite literally picture perfect! This new trend we love incorporates each of your bridesmaid's individuality and also has the stunning resemblance to a watercolor painting. When considering doing different shades of the same color, try to keep it consistent, so instead of just suggesting blue dresses, say grey blues or sky blues. When the dresses are similar but not exactly the same, the end result is a gradient of your favorite color. With this option, you pick a color that fits into your wedding’s color scheme but allow your bridesmaids to choose a hue that’s perfect for them! You can pick a designer, color and fabric but let your girls pick the cut that is just right for them. This is an especially good option if your bridesmaids all have very different body types. It also allows them to express a bit more of their personal style, while still having a uniform visual effect. With this option, you will have fantastic photos and it ensures that the dresses are ones your bridesmaids are sure to love. Choosing a shade like gold or silver is a unique option. Again there is the opportunity for more individuality if you choose to just set the color and length, like pale gold and floor length, but allow each of your bridesmaids to find her own dress. You can also have the more traditional approach with selecting a specific dress or designer for your girls. This look is especially stunning for a winter wedding. Having trouble deciding on just one color for your girls? Break from tradition and opt for printed bridesmaids dresses instead! A fun aspect of the printed dresses is because they are less common as bridesmaid dresses, your girls will likely be able to wear them again as a guest of a wedding. Printed dresses look great, especially contrasted with the groomsmen’s suits, and add depth to the overall picture. The printed dresses contrasted with the bride's white dress really makes the bride shine in all of the pictures! When it comes to bridesmaid dress combinations, there are so many possibilities, make sure you choose the one that is right for you and your girls. Taking into account factors like skin tone and body type is key for choosing whether to have a matching color and uniform cut or to opt for some variety. It is also important to think about the level of formality and the season when selecting dresses for your bridesmaids. With so many options, you are sure to find the perfect dresses for your girls! Can't get enough of Night and Daye Events? For more wedding advice delivered straight to your inbox, be sure to sign up for our newsletter, The Lighthouse!